November Nine Sandwich | sandwich surprise! 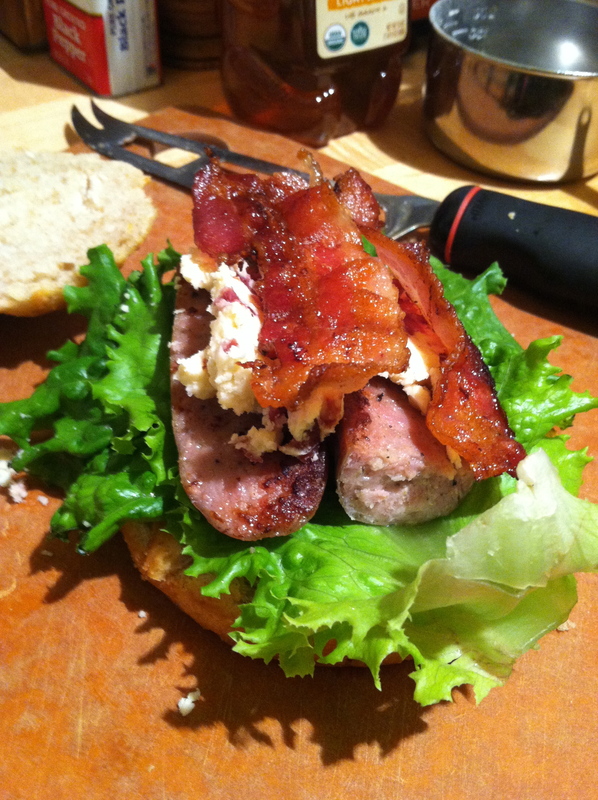 The Sandwich Surprise: A kitchen-sink sandwich called The November Nine. The Inspiration: I love love love this time of year, when my favorite ESPN event — the World Series of Poker main event final table, airing tonight at 9pm ET — follows my favorite holiday, Halloween. The WSOP final table contenders are known as the November Nine. My husband Brant and I are pulling for Mark Newhouse, because back-to-back November Nines. 1. Chips — The tart salt & vinegar baked potato chips from Kettle are also unusually flat, which makes them great for sandwiches. I tried crumbling them onto the sammy at first, but they work better whole. 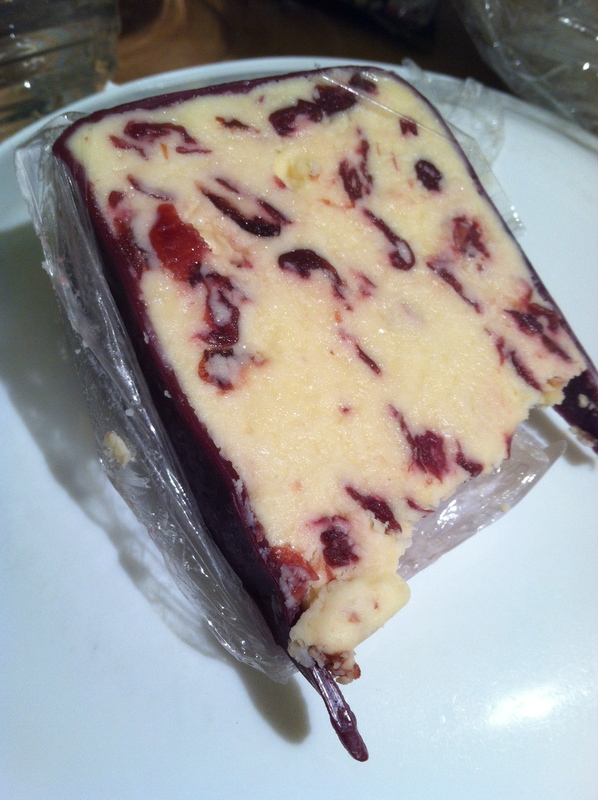 … it’s in this sammy as Wensleydale Cheese studded with Cranberries. 3. … Bacon — Fry it up in a pan. 4. … Bread — Bringing home the sourdough, yo. 5. 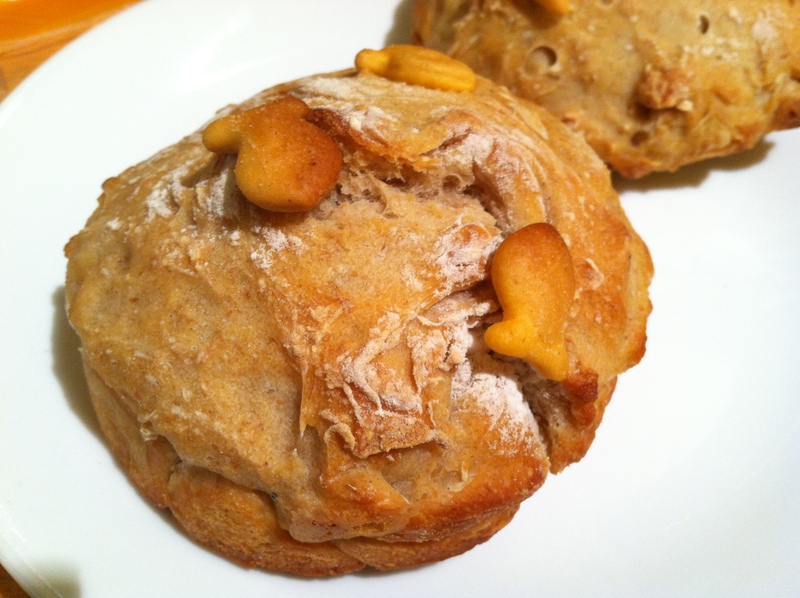 … Cheddar — The November Nine checks cheddar like a food inspector. 6. Fish — Fish is a classic poker term for the human ATMs in every poker room who can’t help coughing up coin to their eager opponents. Tonight’s final table seems pretty fish-free, but I included Pepperidge Farm Goldfish anyway, in honor of thrice-wedded Norman Chad because the ESPN color commentator is such a marriage fish. 7. Monterey Jack cheese — A tip of the hat to the Lon McEachern Memorial Hand, because they always lose: pocket jacks. 8. Bone-in ribeye — Antonio “The Magician” Esfandiari will likely join Lon & Norm in the booth, and he loves the ribeye at Jean Georges’ steakhouse in Vegas. Vegas! 9. Brats — For Poker Brat Phil Hellmuth, who will probably pop up in the booth too. I seasoned the ribeye with Cavender’s, seared it in a pan, sliced it and then sauteed the slices until they were medium well. I cooked the bacon and browned the brats on separate halves of a two-burner griddle pan. I spread a healthy amount of Wensleydale on each half of the roll. Layering lettuce — the casino-y Tropicana green leaf (even though the Main Event is at the Rio) and the meats, I then added a few potato chips and drizzled a melted mix of the shredded cheddar and Monterery Jack on top of the meat. 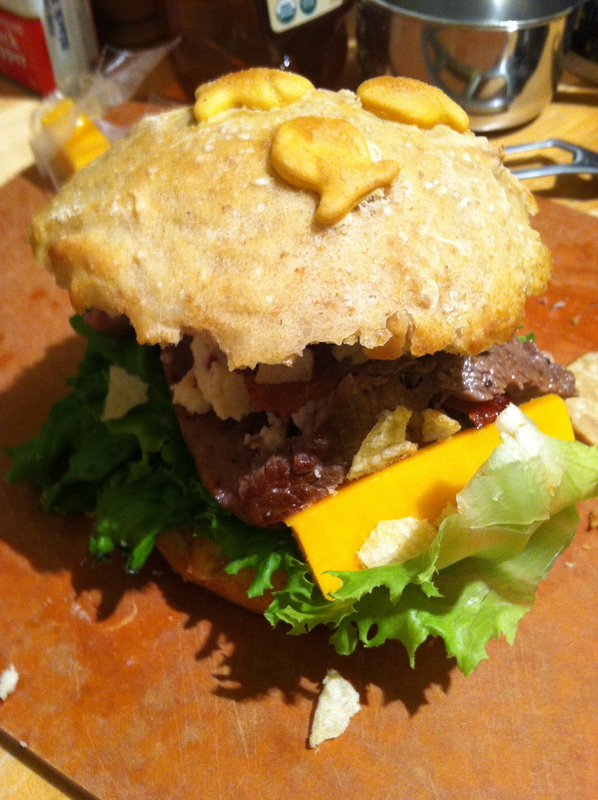 I tried plain old slices of cheddar, but melting the cheddar and jack created more of a cheeseburgery sauce. I had no surprisee this week, but to me, the three cheeses and salty bacon are what pull the rest of the sandwich together. Just a few more hours before vicarious Vegas living. Take it down, Jacobson!